When Alekka told the kids at her school she was moving to Syria, some of them weren’t too clear on the geography. “You’re moving to Siberia?” It drove her nuts for a little while, but that’s middle school for you. Now everybody’s heard of Syria, and we almost wish they hadn’t. I had to look at a map myself when I got the interview invitation in my mail folder at the job fair . Here’s a visual aid so you can picture just where this place is. It’s about the same size as North Dakota. One place Syria is not, is Arabia. 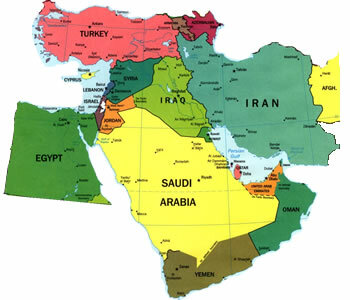 The Arabian Peninsula is south and east of Syria, below Jordan and Iraq. But I still think Lorna of Arabia works because most of the swashbuckling stuff T.E. Lawrence (aka Lawrence of Arabia) is famous for happened in what are now Jordan and Syria. He was a commander in the British and Arab forces that liberated Damascus from the Ottomans in WWI. And he was pretty cool. More about him another day.